Golden beets are a reddish-orange beet with a vibrantly golden interior. Golden beets are very sweet and mellow- their earthy beet flavor is balanced by nutty tenderness. 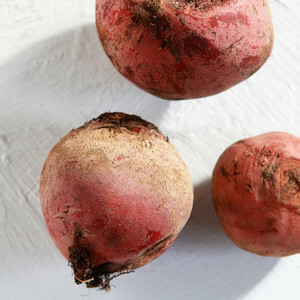 Unlike red beets, their color doesn't bleed, so you don't have to be as careful about staining. Like all beets, golden beet greens are edible and quite nutritious (the actual "beet" is the root of the beet plant). Golden beets can be enjoyed any number of ways, from raw to roasted- we do recommend that you peel them regardless since the skin tends to be rough and unappetizing. Beets are a good source of Vitamins A, B, and C, and fiber.